For all the flak we give the University of Nike (Oregon) about constantly changing for the worse a genrally good looking uni, we must note that the kings of maroon and orange have also developed a penchant for the alternate uniform (not coincidentally, VT is also a Nike-sponsored team). 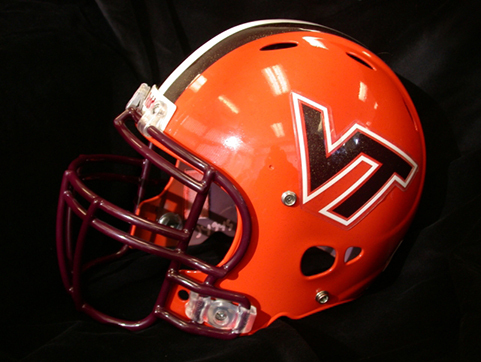 The Hokies have gone with their traditional maroon helmets , white helmets (throwbacks?) at the ACC Championship, and some really choice matte black helmets against Boise State (even if the rest of the special Pro Combat uniform was a little ridiculous). Now, the Hokies are adding a fourth helmet to their season's total: an orange one, presumably in honor of the Orange Bowl. According to Hokiesports.com, “The look was selected by the Virginia Tech team captains and it’s believed to be the first time in the history of Virginia Tech football that orange helmets will be worn. Yes, Hokiesports.com used the word “lids.” Good on ‘em.